First of all a big thank you to everyone that helped out with the first beta (alpha?) test - especially mattchu your input has been amazing. I remember reading a long time ago that there is no point making a cool new feature in a game if a player is not aware of it. It seems I may be guilty of this. 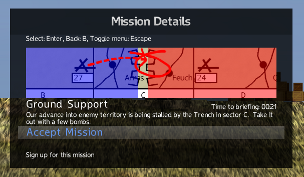 When I asked beta-testers what they thought of the missions, they were not aware there were missions. This means they were unaware of the strategic side of the game completely, and had just flown around and shot at things. It wouldn't have been obvious what the other AI planes were doing, that there was a battle raging high in the skies above, and that there were people on the ground fighting for bases. This is 100% my fault - I was going to rely on a wiki-style website to provide more information, but this wont help anyone but those already interested in the game. So I'm adding messages & hints to coerce the player into opening menus & investigating what is happening within the game, and more messages pop up around important but off-camera events during the game. While most of the experience of flying in the game is fun, there were still some rough edges - especially take offs & landings. These have now be smoothed out, and look a lot more realistic. Obviously, all major bugs should be fixed before release. 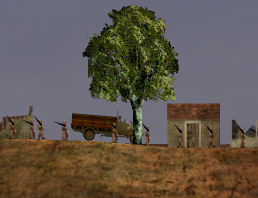 Bugs present in the initial beta include such gems as reinforcement soldiers never leaving their transport trucks, therefore bases never getting replenished, and then never launching attacks over no mans land. Whoops! There were some features still not present in the last beta, that I considered necessary - realistic gun damage for all types of guns / aircraft era, ability to add rivers to a map (and have the planes able to interact with the water), remove air brakes (and wheel brakes too) for planes that historically didn't have them, etc. These issues are either already fixed, or in the process of being fixed. Probably most of the work left is creating new content - maps, scenery, and planes. I cant promise what will go into the game before the next beta, but I'm hoping all code changes will be done, and I'll just have content to do before the game is ready for release. As always, please keep your eye on this website for updates. are you still planning to make include modding for the game? Yes, I am actively developing a tool to create campaigns / planes etc in parallel to the game. I use it myself to add new planes and design campaigns. I aim to release two 'streams' of Storm Clouds games - the first will be free, and will focus on one particular conflict - e.g. WW1, and later some WW2 theatre, and then possibly Vietnam etc. These games will focus on that particular conflict only, and probably only include a handful of other planes from other conflicts for the dogfight mode. You will not be able to load other people's mods into this game. The other side of the coin will be a paid version of the game, for which every campaign conflict I create will be available (more than what is available in all the free games), plus any content anyone else may create. I also want to include features such as 'vs' where you can pit an airforce from one country and time period against another from another country and time period. Things like that. The modding tool will probably become available some time after the paid version of the game, when it matures to a certain level.